It’s raining now. Sunny and raining. We must be in for a RAINBOW! Yesterday, the first performance ever in the newly opened Opera House of Kuwait took place, and last week one of my seemingly far-fetched dreams came true when Netflix had shown four 1 1/2 hour long episode of Gilmore Girls. One of my absolute favourite TV shows back in the days . 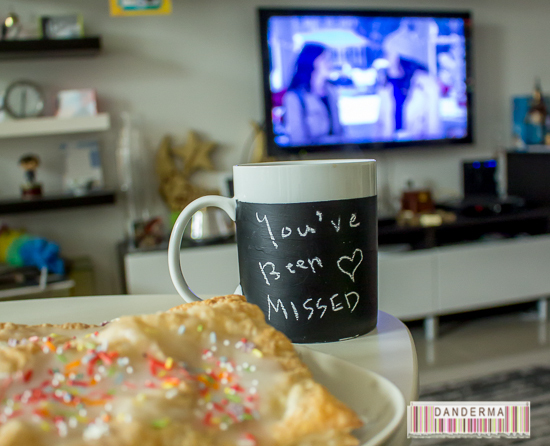 I’ve restrained myself and kept delaying the inevitable as long as I cold and only this morning did I finish watching the fourth and last episode and got to gasp out loud as the last four words of the Gilmore Girls dialogue were revealed. I won’t spoil it don’t worry. 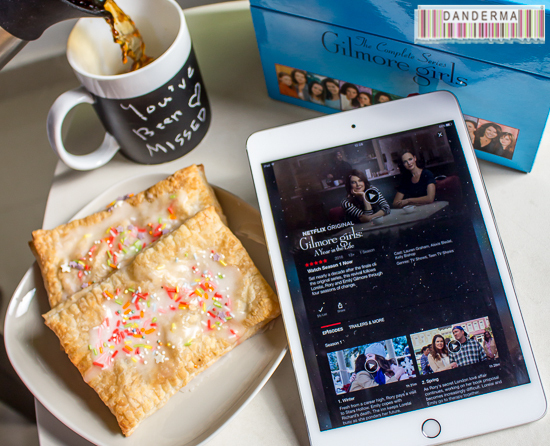 What are the odds that a beloved TV show, one that had entirely shaped my relationship with poptarts, coffee, and food in general, one that I would have wished it would stay running on forever, one that I had plunged into a zombie-like state when it finally went off the air after a very disappointing 7th season, came back almost a decade later to put things right and let us know how everyone in Stars Hollow is doing? Watching it the first time, I’ve wished with all my heart that I did indeed live in sleepy crazy Stars Hollow and had breakfast at Luke’s every morning. Watching it again, I’m filled with the same longing desire to do so. What am I doing here? living in rent, complaining about traffic, frustrated with society, ignoring the news, and dreading next week every single day? I don’t know. 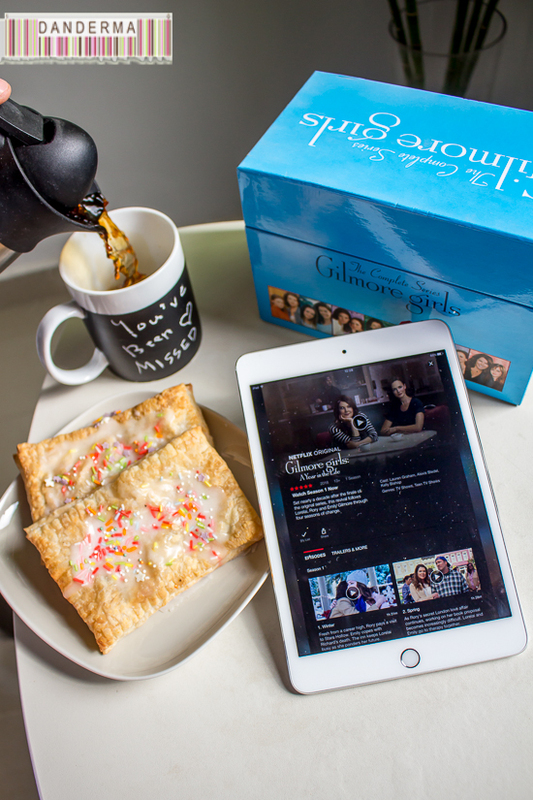 So, in preparation for the 25th of November where I was going to watch the new Gilmore Girls all day long, I’ve decided on the menu: Bottomless coffee and Unfrosted Strawberry Pop-tarts. I use unfrosted because, believe or not for some reason Kellogg’s decided that the frosting of pop-tarts -and cereal- isn’t complete without Gelatin and since I’m a vegetarian I steer away from it and get only the unfrosted kind. I used to get them from Sultan Center without a hitch, however this time around I’ve scoured all of the possible branches of TSC and even got the customer service to check in their system if any branch I haven’t been do indeed stock the unfrosted ones, no luck. What next? 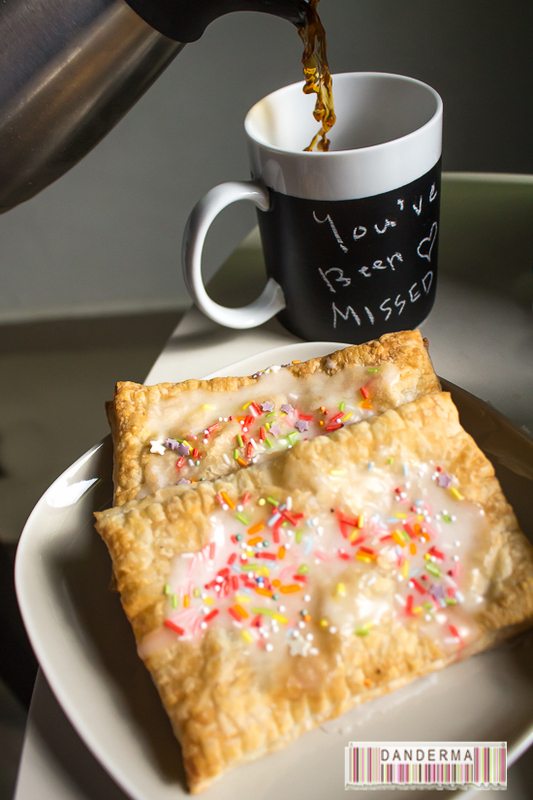 You cannot watch Gilmore Girls without pop-tarts of course, so I’ve decided to make my own. How hard can they be? Right? On the morning of the 25th I’ve woken up early and started to prepare the pop tarts. 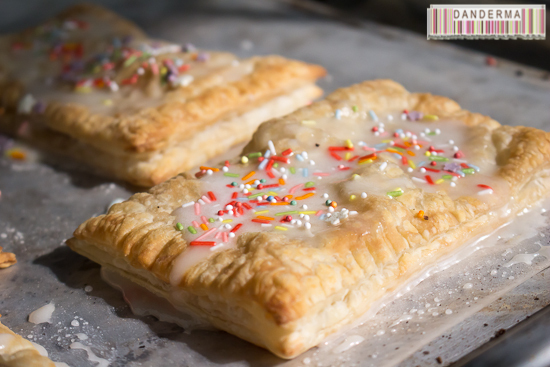 Nothing to it, a simple search using Google produced hundreds of recipes but since almost all of them made pop-tart dough from scratch and I wasn’t bothered, I simply got a couple of sheets of puff pastry from the freezer and let them thaw, made me some frosting and filled my rolled out puff pastry sheets with a strawberry jam mix, baked, frosted, sprinkled confetti sugar, and waited by the TV for Netflix to start showing A Year in the Life of Gilmore Girls. It came on about 11 AM Kuwait’s time if I wasn’t mistaken. The moment, when you see Lorelai sitting in the cold in the town square, waiting for Rory, rambling on, is simply unparalleled. It felt like I was the one waiting for the Gilmores to come back, to give them a hug and ask about their lives. I’ve missed them so much and I can only wish this isn’t the last we’ve heard of them. They simply don’t make good TV shows like these anymore, why Hollywood, why? Did I enjoy it? Absolutely, after I’ve stopped sobbing that is. I love Kirk! I’ve missed crazy Kirk so much and I’m so glad he appears a significant amount of time. Lane and her mother don’t appear that much sadly. I believe Mrs. Kim -which I adore- appears only once and there is a Mr. Kim appearance too! Imagine, after all these years, he does exist! I’ve missed Suki terribly, and Christopher, and sadly they only appear in a brief scene each in the very last episode. When Suki came, the puzzle was complete and I began sobbing uncontrollably once again. No Suki and Jackson action though sadly, we barely get to see Lane and her boys, we don’t get to see Suki’s children. We get to see Paris only in one episode and I’ve missed her. Somehow, between trying to squeeze all characters in those four episodes/6 hours, the plot kind of wobbled. We see Rory, the one-time all planned out and so sure of herself, stumble as she reached her mid-30’s and not entirely satisfied with her life anymore. How can it be? How can I, a person who always loved and identified with Rory, be somehow in the same boat as her in what is supposed to be the prime of life? I could totally understand how lost and frustrated she is. After all, you only have one life time and you get to realise at one point that you cannot squeeze every thing you want to do in one single life time, no matter how hard you try. In a way I wish that instead of four movie-long episodes we got one full season, one last one with no strings attached, even if its something like the X-Files little season, but with more of a defined and developing plot and more time to give to our beloved characters. Wobbly plot or not, the ending, the last half hour of the last episode of the long awaiting a year in the life of Gilmore Girls, is the best and most heartwarming of them all and it so made up for it. The four words, if you’ve made it till then, the four words, OMG! Please don’t let it be the Wookie’s! Now it’s gone and over with, I’m not sad at all, you know why? Sherlock series four is back in 28 days and I am to plan a Sherlock marathon to rewatch all its episodes and prepare for the long awaited and presumedly last series. 2 years I’ve waited, 2 bloody years! P.S. I’m praying for a Friends revival, or even a Friends movie. I’d settle for a glimpse of Friends, anything, I simply miss them so much.